THE PERFECT BIRTHDAY PRESENT WITH A DIFFERENCE! a fully comprehensive in-depth study of what makes you tick, as detailed by your birth chart. Your birth chart is unique to you and involves MUCH more than merely your star (Sun) sign. With this analysis you will discover the real you – the potential stored within you and the key to unlocking it; the type of people you are drawn to; why you react to situations in the ways you do; the vocations to which you are best suited; etc. etc. You will see how each planet leaves its individual mark on you. Find out your strengths and weaknesses and your destined path in life. Many people say to me that having had a birth chart profile they feel no need for a year ahead forecast or anything like that, as it reveals so much about where they should be heading. We are never too old to stop learning about ourselves, but for young people with most of their adult lives still ahead of them, these profiles can be invaluable. Many people ask me to prepare them for newborns or young children, as the parents then get a valuable insight into the child’s development, and of course the booklet can be passed on to the child when it is old enough! Totally personalised and unique to the individual. 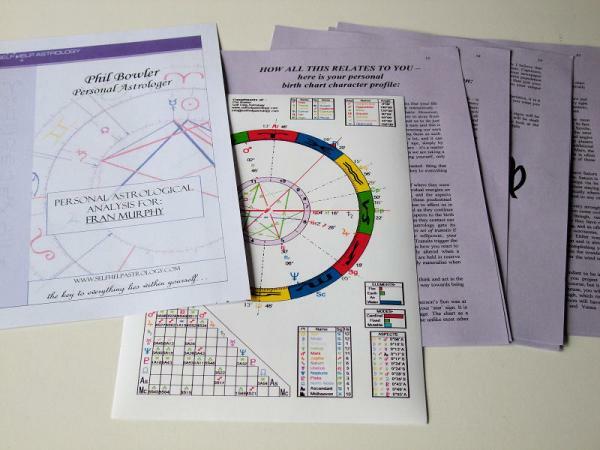 Complete with a full colour birth chart and details of how to interpret it, plus a detailed introduction to astrology. Presented in an A4 folder comprising of 40+ pages. I need to know the name, TIME, place and date of birth of the person whom the profile is being written for. I need to know the name, TIME, place and date of birth of the person whom the profile is being written for. The profile will be posted approximately 2 weeks after receipt of payment. Postage price includes printing and material costs.